My brother first started skimboarding as a kid. I remember old summer days going down to the beach and eating sand for hours because we used some $20 board from Walmart. I am thankful to say those days are far behind us. Unfortunately, and surprisingly enough this sport requires one particularly important element – a skimboard (ha!). This is an area where many people get stuck, especially if they are beginners as it can be difficult to differentiate the good from the bad. Since there are so many poor-quality products out there, when you fail to do the right research, then you may not exactly find the right skimboard for your experience level. In this article I’m summarizing best skimboard for beginners. It’s a job of 12+ years of finding products that worked (and didn’t) to save you from the time it took us to find the right board. An option from one of the best skimboard brands out there. Affordable pricing and durable construction. 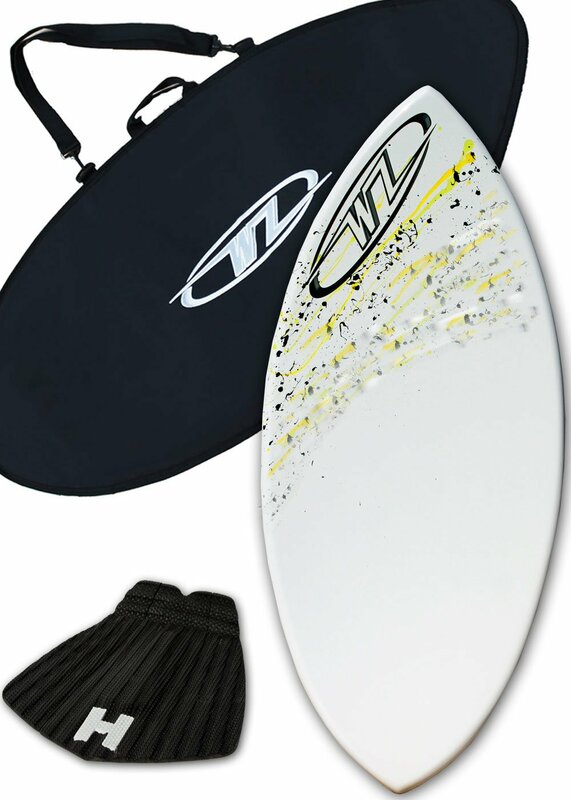 A complete package that includes everything that beginners need for their very first skimboarding session. When you are just starting out with skimboarding, then it’s crucial that buy a board that will make things a little easier for you. Below, I share some of the best skimboards for beginners to help you choose one that will help you master the sport of skimboarding. If you have experience skimming then skip down to the Best Skimboards For All Experience levels which you can jump to by clicking the link in the quick navigation below. ​This is the perfect skimboard for those who are dipping their toes into this sport – the best beginner skimboard. The board is made by Zap, a brand with years of experience in developing high-quality products. The product comes with a variety of attractive designs. The brand has used their unique Composilite construction technique for this particular skimboard, which ensures that the board is durable and it will be able to withstand some tougher situations out on the ocean. The quality of the Zap Wedge Medium Skimboard is one of its greatest features. The board is made from very high-quality material to provide maximum performance and reduce the risks of the board breaking. The board’s size is also ideal, which makes it perfect for most people who want to skimboard. Even though the board has many good qualities, there are a few things that may be considered a drawback. For one, even though this particular skimboard is an idea for most people, the manufacturer claims that it is only ideal for children and young adults. This means the product may not be ideal for individuals with relatively large body weight. No specific details are shared regarding the weight limit, however, which can make it somewhat difficult to determine who the ideal customer is. This board was specially designed for beginners and is made from fiberglass, known for its exceptional performance in the water. In addition, the package comes with a traction pad, allowing for a better grip while skimboarding on the open waters and riding the waves. The Wave Zone Skimboards package includes products that have all been made in the United States. The package includes a complete starter kit with a board and a traction pad, as well as a bag that has been shaped according to the skimboard for easy carrying and transport of the board. Depending on the package chosen, the board is also a relatively affordable option when compared to other skimboards that are available now. Customers can also choose if they want the complete package, or rather only buy the board itself. The weight support of the board is somewhat low – the maximum rider weighs supported by the board is 90 lbs. Furthermore, the size of the board is also smaller than some of the competing options. While this particular skimboard is perfect for beginners, it may be an ideal option for parents who are looking to teach their children how to skimboard. A cheap option for beginners who are not sure whether they truly want to start skimboarding on a regular basis. ​The Liquid Shredder Wood EVA Deck Skimboard is a great option for anyone who is looking to buy one of these products without spending too much money on it. It is definitely one of the good cheap skimboards on the market. A good example would be someone who is on a very small budget or a person who might feel interested in the sport, but not really sure it is right for them. The product also comes with different options to choose from to ensure it matches the preferences of the buyer more appropriately. The price of the Liquid Shredder Wood EVA Deck Skimboard is most certainly the first benefit that people see when they look at the product. At less than $50, most individuals who want to give skimboarding a go should be able to afford the board. The smaller option is also available at an even lower price. When you buy this product, you can choose between two colors, including blue and green. The two available sizes that the product comes in include 35” and 41”. ​The board is not made from the best quality material out there, so it will not be as durable as some of the other options out there, but it is still a perfect option for beginners – especially children. Even though different colors are available to choose from when buying this skimboard, the color options are very limited. A high-quality option for beginners who are serious about learning a new water sport. 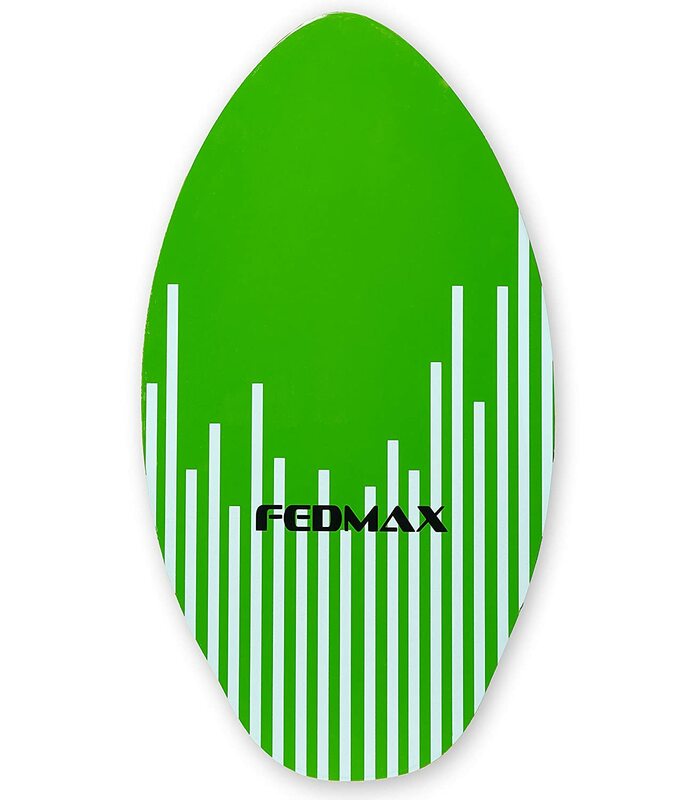 ​The Fedmax Skimboard with Fiberglass Body & Carbon Fiber Tip Hybrid is an ideal option for begin-ners who prefer to make an investment in a high-quality board that will last them a more significant period of time. This is one of the top skimboard brands. The board comes in two different sizes, including a 44-inch option that supports riders that weigh up to 130 lbs, and a 48-inch board that can support riders who weigh up to 160 lbs. This is a great improvement over the weight limit supported by many of the other boards that are good for beginners. This skimboard can support heavier riders as compared to alternative options. It is made from top-quality materials with a tip constructed from carbon fiber, which ensures a smoother ride through the waves. The board is available in three colors, including green, red, and blue. The buyer also gets a complete kit of traction grip accessories with their purchase, which helps to improve their experience and also makes things easier for a beginner. The “Ultimate Tips Manual” that is included with the purchase also offers some useful advice on how to get started with this sport. 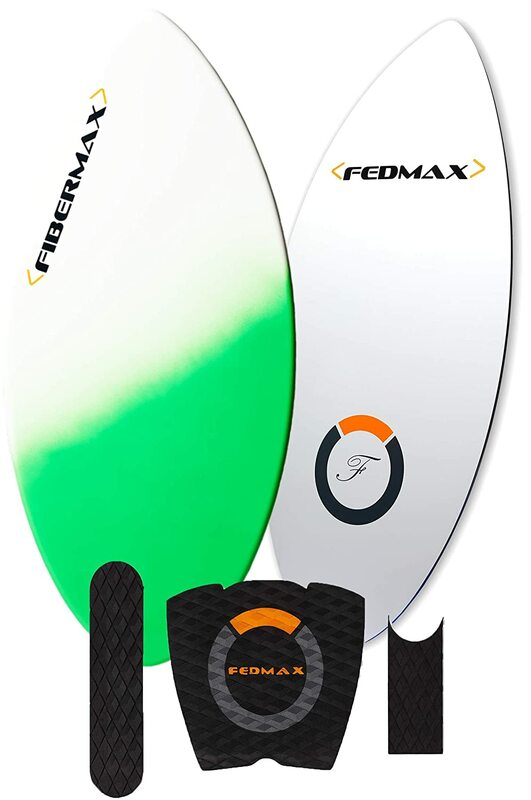 The price of the Fedmax Skimboard with Fiberglass Body & Carbon Fiber Tip Hybrid is a little high for some people only interested in trying out the sport. The design of the board is also very limited and only available in one particular style, even though three different color varieties are offered. An affordable option from Fedmax that is perfect for both kids and adults. At the core of the Fedmax Skimboard with High Gloss Coat is a layer of poplar wood, which is a lightweight wood that is resilient and durable. A layer of rubber and a high gloss coating is found on the outer layers. The combination provides a convenient experience for those who are trying skimboarding the first time but is also great for intermediate individuals. The board does not require a lot of maintenance to look good and even comes in a variety of choices that the buyer is able to choose from when they decide to opt for this skimboard. This skimboard is an ideal option for beginners because of its design, the materials it is made of, its shape and, of course, its price. At less than $40, this skimboard offers support for riders that weigh as much as 220 lbs, which is something that other boards in this price class usually cannot offer. The skimboard is available in a standard design, which comes in green or blue colors, or a wooden option that comes with exclusive artwork printed on the board. This board does not feature any special type of material on its tips and does not offer a fiberglass coating. Some interested customers may also prefer a wider range of colors to choose from, as green and blue are two basic colors that most of these products are offered in. Having a unique option to choose from would have been a nice addition to this skimboard. Now that we have looked at some of the best skimboards out there for beginners let’s take a look at a few options that are good for people with any experience level – whether beginner, intermediate or an advance skimboarder. We did a lot of research and tested out some options to bring you the best options. A high-performance, heavy-duty board for those who want to skimboard frequently. 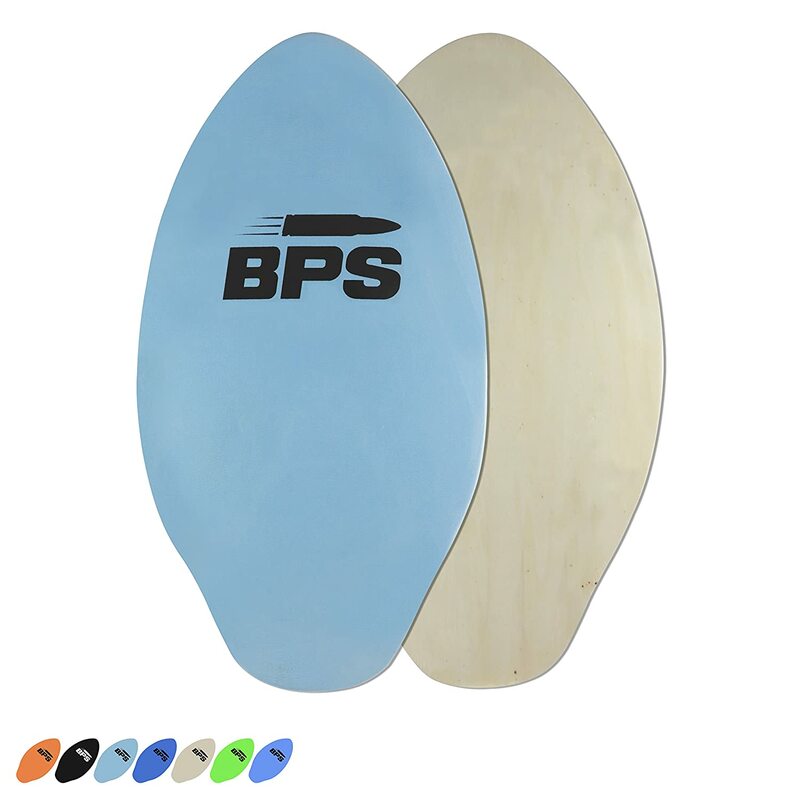 The ‘Gator’ skimboard, which is made by a top-rated brand, BPS, was designed to be a great option for everyone, regardless of how experienced they are. Beginners can get started with this board and continue to use it as they become more experienced and advance in this popular water sport. 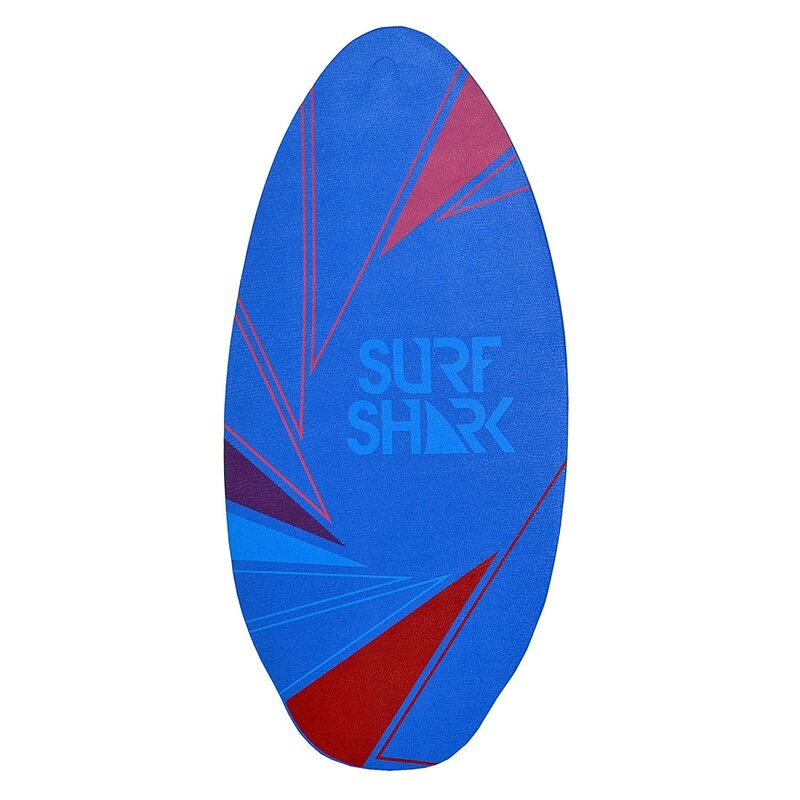 The product features a special layer with built-in grip padding, which means there is no need to buy additional surf wax to use this particular skimboard effectively. This is a board that is made of high-quality plywood, which is durable and a good option for water sports. The board is also coated with epoxy, which helps to add more stability to the board and also acts as a layer of protection, making the board much more durable. The special EVA foam layer also helps to ensure adequate grip while using the skimboard. The board is available in six different colors. The primary downside to this skimboard applies to customers who opt for the raw wood option, as no added grip padding is found on this particular skimboard. The board does state that one option supports riders who weigh up to 150 lbs, but no weight limit is provided for the 40-inch option. A skimboard that comes in quite a large variety of options, including different artwork, colors, and sizes. Crafted by the Sunspects brand, this is one of the most attractive skimboards that you will find. The product comes in a variety of artworks and designs that you can choose from, including different colors. Color options include orange, silver, green, yellow, blue, pink, and more. The board is constructed from solid wood, which makes it a more reliable option than some competitor options on the market, and greatly reduces the risk of the board breaking when it hits a rock. ​The color variety is definitely the best feature of this board, but there are many other excellent advantages that should be noted. The board comes in four different sizes, ranging from 30-inch to 41-inch. The rubber layer that is installed over the board also adds better grip, which means there is no need to use any type of wax before going into the waters to skimboard. This is convenient and will ultimately save the rider a lot of money. Even though the board features solid construction, it is not built with the same types of wood that some of the higher quality boards are built with. This means that the board may start to wear off faster than alternative options. Even though a non-grip layer is installed, it does not seem to work well for everyone. 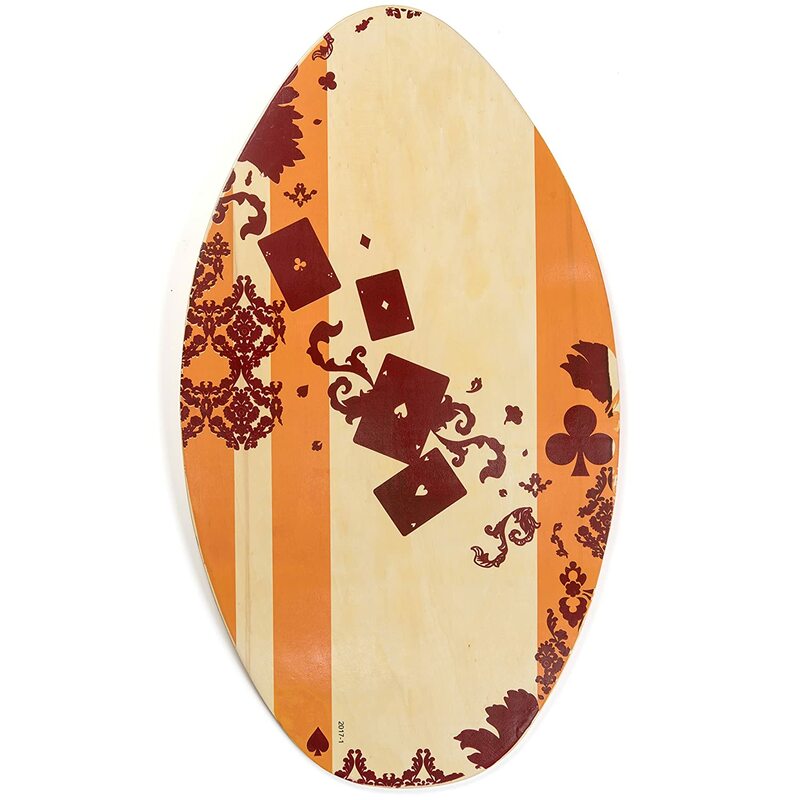 The Lucky Bums Wood Skimboard features custom designs and comes at a really low price. This is a great board for people who are looking for a skimboard that is made from wood but still offers an attractive design and durable performance. 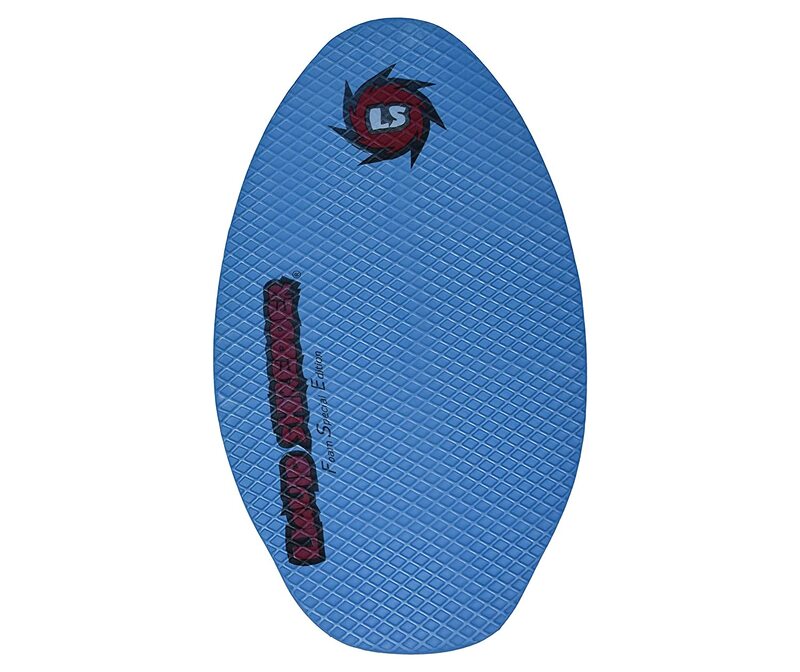 The board can be used for skimboarding, as well as for flatland skimming. It has been constructed with beginners in mind, but also offers the perfect shape and features that make it an appropriate option for individuals with more experience. 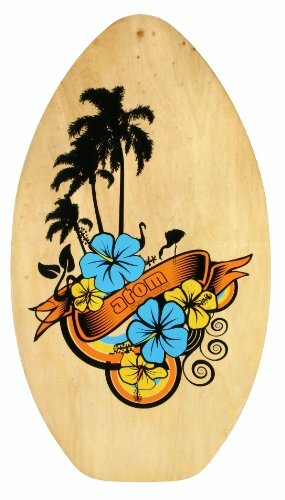 The Lucky Bums Wood Skimboard comes in four different designs, including The Clubs, Manta Ray, Wave, and Tattoo. These designs have all been custom-made and are unique to this particular brand. The price of the skimboard is also very low compared to some of the other options. The satisfaction guarantee is also a great benefit to be noted – a 100% money-back guarantee is offered for those who are not happy with the product. The designs are attractive, that is for sure, but there are only four particular options available that customers can choose from. The high gloss coating might also be a little uncomfortable for some of the riders as it might not provide a good level of grip while the rider is skimboarding. The warranty offered on the product is limited as well, which is something that should be kept in mind. The SBBC Skimboard was designed to help kids get started with skimboarding and are also good for those kids that are more experienced at this sport. The product comes with a specially designed form, that was crafted to help provide the rider with a more comfortable experience while skimboarding. 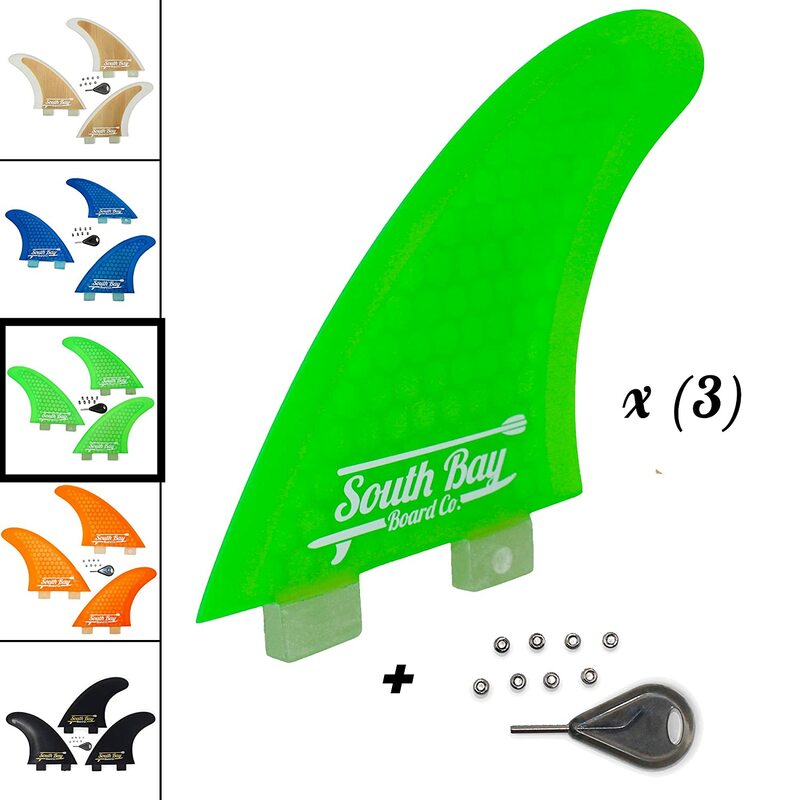 Both the tail and the center features unique design specifications to help reduce the risk of a nose dive, as well as to increase the speed of the board greatly. A great thing about the South Bay Board Co SBBC Skimboard is the fact that it was mainly made for kids, but can still be used by some adults, as riders can weigh up to 160 lbs. The board has a couple of unique features that were implemented to help improve the rider’s performance when they decide to opt for this particular choice. Furthermore, a custom texture is used in the upper layer of the skimboard, which completely eliminates the need for any type of waxing. Various colors are available to choose from, but the choices are still very limited, which can be an unpleasant feature for some individuals. The materials used are appropriate but are not as good as some of the other options we have mentioned in this review post. Additionally, even though the board is very affordable, there are cheaper options available when the board is bought for a kid who has never skimboarded before. A wooden skimboard that comes at a relatively affordable price, with attractive graphics on top. This is a very basic skimboard that is good for beginners, but also offers the features that more experienced riders will need to get a more customized experienced when they go skimboarding. The skimboard comes with custom graphics printed on top of the wood, as well as a special laminated coating that helps to improve its durability. The board is relatively affordable and has been made with a wooden material known as poplar wood. This type of wood is known to provide durable performance, while also ensuring resilience against the watery environments where the board is used. The manufacturer fails to share an adequate amount of details about the Atom Skimboard with customers. This is most certainly a downside. No details of a warranty or any special features offered by the board can be found. Furthermore, the photo was heat transferred, which means it may become dull with excessive exposure to the sun. The BeachMall Deluxe Wood Skimboard is available in different sizes, colors, and designs, and is made by a reputable brand. The BeachMall Deluxe Wood Skimboard features solid construction, which adds to the durability of the board. A custom grip is also installed for better performance while skimboarding and provides a better overall design and construction than many of the alternative options that are currently available. The user can choose from various options, such as the size of the board. The sizes available include 30-inch, 35-inch, 37-inch, and 41-inch. The variety of designs and colors is one of the best features that are offered by the BeachMall Deluxe Wood Skimboard. Color varieties include a surf shark print on a white background or a navy blue background. Other options include a BL print on light blue, green, neon green, and navy blue. The board features a great construction to make it last longer, while the special protective coating prevents water damage. While there are many options to choose from, only three main color varieties are available. Furthermore, even when choosing the largest option, the board does not support riders who weigh more than 140 lbs. No details are provided on the type of wood used in the construction of the product, which means the quality cannot be accurately determined. When it comes to buying a skimboard, things can be a little tricky when it comes to choosing the right option. Fortunately, with some education and tips in mind, you will be able to recognize the good options and know when to avoid a skimboard that will not offer you the durability, quality, and the performance you desire. No need to read a complete skimboard buying guide – you just need to know a couple of tips to make the right choice. There are a couple of factors that you need to take into mind before you decide to buy a skimboard. Below, we are going to take a closer look at some essential tips that might make a choice a little easier when you start to shop for one of these products. First, consider your experience level. Some skimboards are more appropriate for experienced individuals, while others are great for those with no experience at all. You will need to buy a skimboard that is appropriate for your particular level of experience in this water sport. In addition to knowing your own experience level, you should also ensure that you know how much you can really spend on one of these boards. The prices can vary quite widely, which is why it is a better idea to start shopping for a skimboard once you know your budget. Some options are available for under $50. On the other hand, there are also skimboards with prices that reach well over $200. When you know how much money you can spend on one of these boards, then you will be able to know what to look for. Your weight also plays a vital role in what particular option you can choose when shopping for a skimboard. Some of the options out there are more appropriate for kids, while others can support adults and riders with heavier body weight. Know how much you weight before you start searching, as it would allow you to know which boards can support you and which ones will not support your weight. You should also consider whether you prefer a package or to just buy a skimboard. If you do decide to only opt for a skimboard, determine whether you want to use your own grip padding, or would you rather prefer to buy a skimboard that comes with a built-in layer of foam or rubber to provide proper grip while you are out there skimboarding. ​Reading up on some skimboard reviews may also be a good option. A couple of safety tips should also be taken into consideration when you are planning to buy a skimboard. Safety should always come first – and beginners should know what to look for. The most important tip is to ensure you have adequate grip. When there is no grip on the board, then you will be more likely to slip and fall. This can be an unpleasant experience, especially for younger individuals. ​What is the best material for a skimboard? Skimboards are made from many different materials. This can be quite confusing. The majority of these boards are made from a wooden layer on the inside. Different types of wood are used. It is usually a better option to go with a skimboard made with solid wood construction. When it comes to the surface, rubber is often used, along with special coatings, to help protect against water damage. Skimboards with a fiberglass coating are often preferred, as such an option provides for more durable performance. ​What is the best shape to choose? One thing that you will notice when you want to buy a skimboard is that there are many different shapes available. This makes many people question what particular shape they should opt for. This question really has no definite answer. In many cases, people often prefer a skimboard with a specially constructed tip. This helps to create better performance while skimboarding. Additionally, some boards also have special construction features that favor speed, while also helping the rider avoid nose diving (which is when the front part of the board goes underneath the water, which eventually causes the entire board to go underwater). ​How much should I pay for a skimboard? Another common question that is also difficult to answer. Skimboards that are more expensive are usually made from better quality materials, which adds to its performance and durability. This, however, does not mean should not opt for a cheaper option if you are on a lower budget. If you can spend $150 to $200, then opt for a higher quality option. If you cannot, then there is nothing wrong with buying a $50 board – just be sure to do some research and to assess the quality of the board before purchase. There you have it. our guide on best skimboard for beginners. But to be honest, It can be confusing to buy a new skimboard. Beginners are not sure where to start. Even experienced individuals often find it difficult to find a brand that can offer them quality options to choose from. After we did some investigating and testing, we found the best options on the market for everyone – whether beginner and still in training, or already an expert.